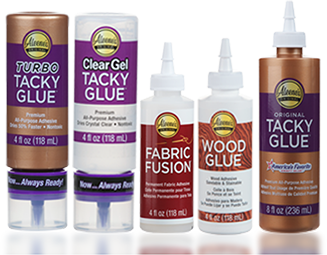 Aleene’s Original Glues - How can I use glue as a resist on fabric? How can I use glue as a resist on fabric? Apply the glue to the fabric in the design of your choice. Allow the glue to dry completely on the fabric, becoming rigid and clear. Paint or dye the fabric in the colors of your choice. Allow the fabric to dry completely after applying the dye/paint. Soak the fabric 20 to 30 minutes in warm water to soften the glue. Hand wash or machine wash the fabric in warm soapy water to remove the glue entirely. Tip: Aleene’s Clear Gel Tacky Glue makes a great resist on fabric.